U.S. Air Force Airman 1st Class Sequan Gill, 100th Logistics Readiness Squadron Forward Arming and Refueling Point technician runs out a fuel hose to an F-15C Eagle from RAF Lakenheath July 26, 2017, on RAF Mildenhall, England. On Ju. 26, 2017 F-15Cs assigned to the 493rd Fighter Squadron practiced Forward Arming and Refueling Point (FARP) exercise at RAF Mildenhall, England. According to the commander of 493rd Fighter Squadron, Lt. Col. Jason Zumwalt, this is the first time any MC-130 variant had done a FARP with a F-15C. “This was the first ever FARP between any MC-130 variant and an F-15C. It was important because it helped to prove the concept of integrating the FARP capabilities of the MC-130 with the F-15C. This capability could provide improved flexibility for future operations,” he said. Two U.S. Air Force 352d Special Operations Squadron Deployed Aircraft Ground Response Element team members assist with airfield security while a 67th Special Operations Squadron loadmaster finishes unloading F-15C Eagle weapons crews and supplies from RAF Lakenheath from an MC-130J Commando II during a Forward Arming and Refueling Point, or FARP, exercise on Jul. 26, 2017, on RAF Mildenhall, England. 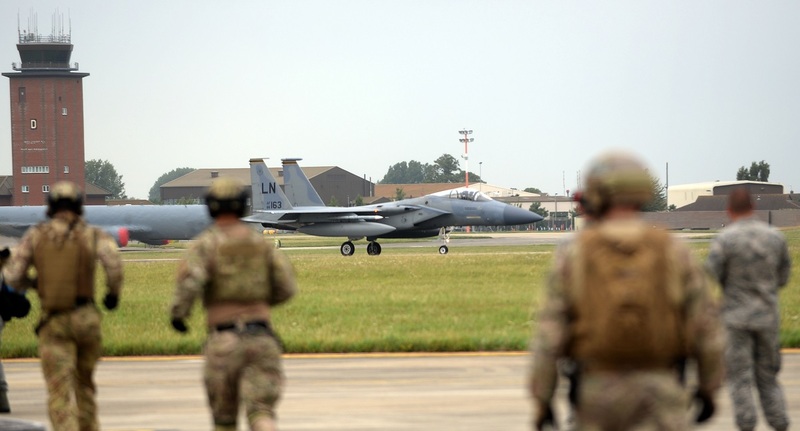 Exercise Rapid Eagle saw two MC-130Js from the 67th Special Operations Squadron (SOS) flying into RAF Lakenheath to pick up F-15C maintenance crews and armament supplies. 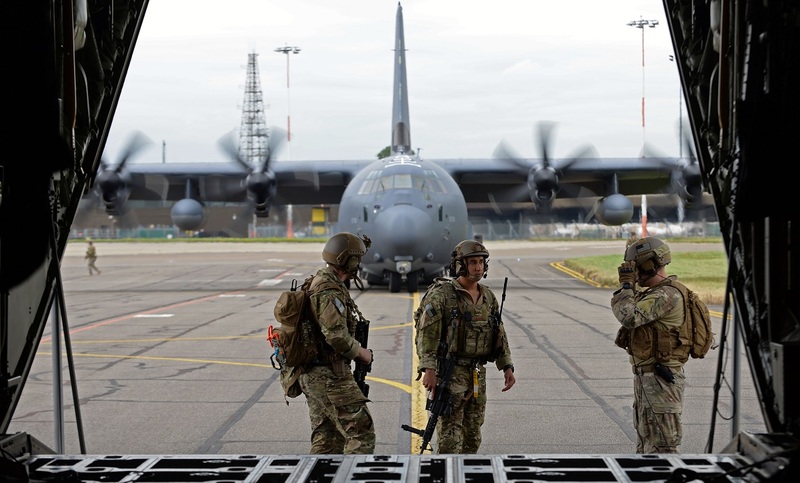 The airmen were dropped off at RAF Mildenhall after which the MC-130Js proceed to a FARP location to refuel four F-15Cs. A FARP is an austere location near a combat zone where fuel and supplies can be transferred from one aircraft to another. 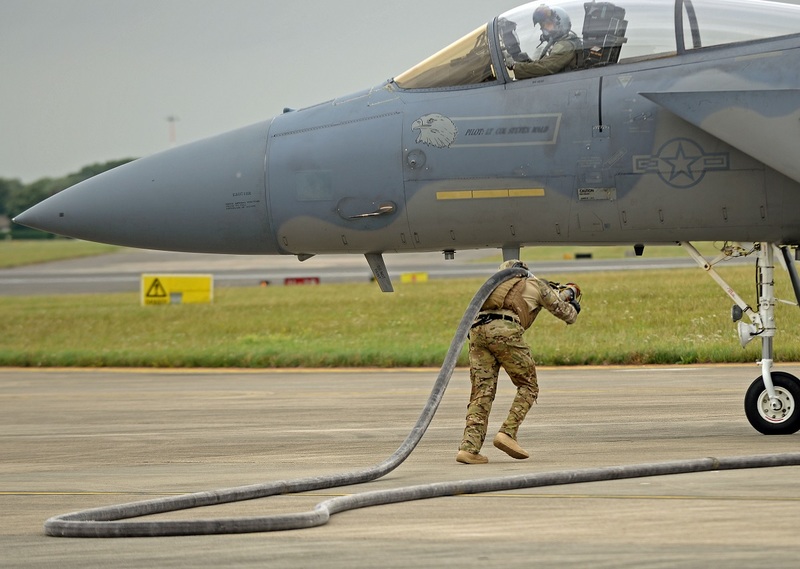 U.S. Air Force Airman 1st Class Michael Ricci, 100th Logistics Readiness Squadron forward arming and refueling point, or FARP, technician carries out one of the 100 foot hoses used to refuel four F-15C Eagles, from RAF Lakenheath, during a FARP exercise on Jul. 26, 2017, on RAF Mildenhall, England. As explained by A1C Luke Milano, 352 SOW Public Affairs, in the article Three UK-based wings conduct first-time FARP exercise, because of its nature, the drill included the involvement of three separate wings: the 48th Fighter Wing (FW), 352d Special Operations Wing (SOW) and 100th Air Refueling Wing (ARW), each having their own part to play in the overall success of the exercise. A U.S. Air Force F-15C Eagle lands on RAF Mildenhall, England, before being refueled by an MC-130J Commando II on Jul. 26, 2017. 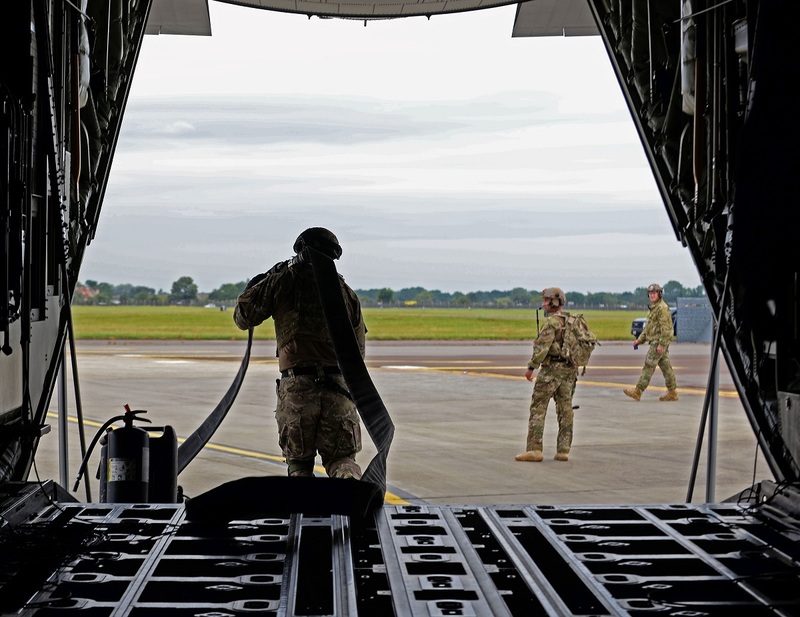 Having a FARP capability plays an important role for deployed aircraft in austere locations by allowing U.S. forces to shorten the amount of time needed to return to the mission. 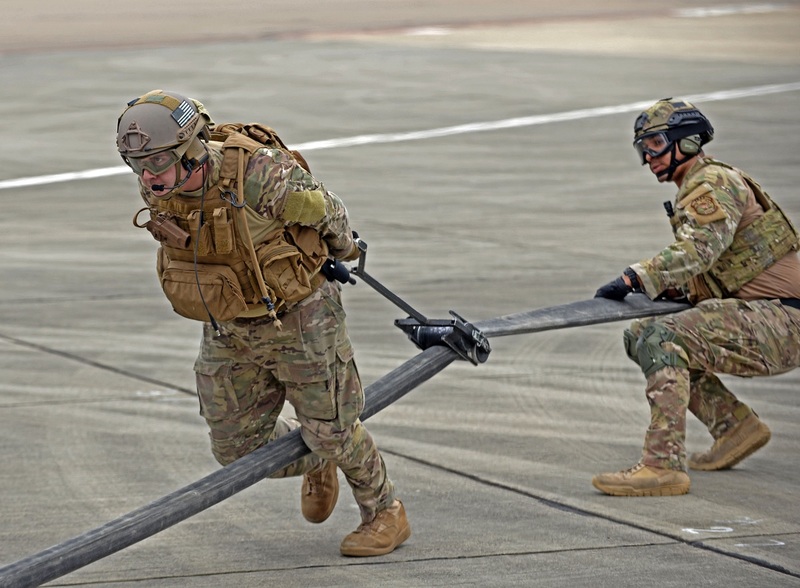 U.S. Air Force Airman 1st Class Michael Ricci, right, 100th Logistics Readiness Squadron Forward Arming and Refueling Point technician aids a U.S. Air Force 67th Special Operations Squadron loadmaster with removing residual fuel from a hose using a tool called a ‘squeegee’ on Jul. 26, 2017, on RAF Mildenhall, England. As explained by Zumwalt the drill has been a success. “Exercises like this help increase our ability to integrate our capabilities and train our Airmen in unfamiliar tasks,” he pointed out. 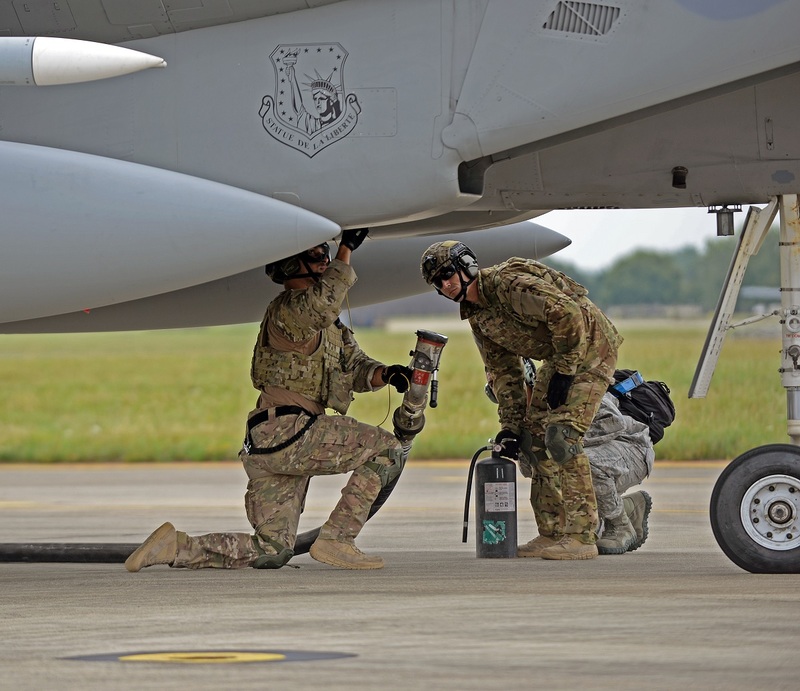 U.S. Air Force Airman 1st Class Michael Ricci, 100th Logistics Readiness Squadron Forward Arming and Refueling Point, or FARP, technician begins to hook up a fuel hose to a F-15C Eagle from RAF Lakenheath as U.S. Air Force Staff Sgt. Brian Nichols, 100th LRS FARP technician stands nearby with a fire extinguisher during a FARP exercise on Jul. 26, 2017, on RAF Mildenhall, England.